Contrast. Elements that aren’t the same should be very different so they stand out, making them “slightly different” confuses the user into seeing a relation that doesn’t exist. Strong contrast between page elements allows the user’s eye to flow from one to another down the page instead of creating a sea of similarity that’s boring and not communicative (Rundle, 2006). Repetition. Repeat styles down the page for a cohesive feel â€” if you style related elements the same way in one area, continue that trend for other areas for consistency(Rundle, 2006). Alignment. Everything on the page needs to be visually connected to something else, nothing should be out of place or distinct from all other design elements (Rundle, 2006). Proximity. Proximity creates related meaning: elements that are related should be grouped together, whereas separate design elements should have enough space in between to communicate they are different (Rundle, 2006). Connections to example: why is our website CRAP? Contrast is done by using shades of brown and color of blue which creates attention, differentiated elements, directs attention around the page. Important things are big in comparison to less important ones which are smaller. There is a contrast between background and text. Repetition is used to create organization. Features that are repeated are colors, layout, navigation. It is applicable across the whole website which makes website distinct, memorable, and easy to use. Alignment gives to the page a fresh look, organizes, and provides invisible lines which help drawing attention. All the features of the page are well balanced. 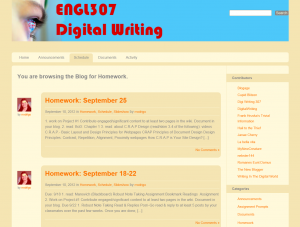 Proximity allows to group related elements together such as homework, contributors, etc. Website has enough distance between different objects and reduced space between related objects. It is very important to be able to spread message effectively. In the class we are taught how to do it. One the ways is to create website that catches attention of the audience. If the website is done well according to CRAP principles it is most likely that audience will be interested at looking at the website. Therefore, as students we have chance to learn the design rools and apply them on practice. Reading my classmates’ posts it made me realize how different we all are. Different articles are viewed differently by different people! I was enjoying this DIFFERENCE! Anyways, due to the fact that I was not assigned to read some of the articles, I have decided to concentrate on them for my better understanding. After reading the post of my two classmates I received a new perspective on the levels of technology which helped me structure my understanding of the media and what is actually more important: media or message. If you look from the perspective of layers it becomes clear that users, media, and message are interdependent and work together as a whole. McLuhan’s idea is that sometimes the media is more important than the message. Therefore, creation of the message is not enough. But choosing the right media is what matters most. In case when media is chosen perfectly, it becomes even stronger than the message itself. While I was browsing the posts, I found very interesting discussion about what new media really is. There was an example with IPhones. I personally have IPhone4 now and since a couple of days ago new iPhone5 was released do I think of my phone as an old one? I’m not sure. May be it is because I got mine only a few month ago and for me for an individual user it is still new. May be for a person in developing country it is still a dream. I think it depends on the society and what it is ready for. Numerical representation. All new media objects are composed of digital code – numerical representations. There are two key concepts: new media objects can be described mathematically and such objects are subject to algorithmic manipulation. Therefore, media becomes programmable. In a process of digitalization continuous data is converted to discrete data, data occurring in distinct units which are not units of meaning. Modularity. New media objects have modular structure; they are separate identities which can be combined into large-scale objects without losing their independence. Every element can be accessed on its own. Automation. New media objects can be created or modified media using templates or algorithms. Together with creation of new media objects, already created objects need to be easily available for access. Due to modularity of new media it can be easily found among other objects in a data base with the help of artificial intelligence of new media. However, AI is limited. Variability. New media objects can exist in potentially infinitive versions due to its numerical coding and modular structure. It can be easily edited and, therefore, customized. It changes together with social changes. Transcoding. There are two distinct layers: “cultural layer” (content, meaning, qualities, etc.) and “computer layer” (file size, file type, file format, etc.). Structure-wise, new media objects are compatible to, and transcodable into other computer files or the adaptation of new media for display on different devices. In The Language of New Media Manovich gives us basic structure of new media showing that the structure is clear, simple and flexible. Students as users can easily create new media using simplest units – discrete points, access objects of new media navigating in the media space, and modify already created objects. This allows students to experiment with new media resources, customize previously created objects, and, mainly, it allows students to see media as an ever changing process with possibility for communication rather than solid structure with no ability or limited ability to create and change. In his work Manovich shows us that simply comparing old and new media “will not tell us the whole story” (47). His idea is that the new media is a result of digitalization of old media, in this process, however, some information can be lost. Change in media is always correlated to change in society. If old media valued “conformity” and “factory” production, new media values “individualization” and choice (42). The key difference between old and new media according to Manovich is that new media is programmable, it does not “hardwire” structure and content together, and it is interactive. Manovich, Lev: The Language of New Media. MIT Press: Cambridge, Massachusetts / London, England 2001. In the world of media it is very important to follow the rules. It is easy as one click to post something online; therefore, it shouldn’t be surprising how easy it is to get punished for taking something you don’t own without permission. With the change in law it was very confusing at first what copyright or Big C was and still is. However, the situation changed with an introduction of new user friendly options such as public domain, fair use, and creative commons. When being an owner of a particular work it is very important to be able to decide what you want do with your creation. With Creative Commons you can have ALL rights reserved but you can also give SOME rights to the public. With these being said, the owner most likely will want to make profit if possible, or simply get a credit for his or her creation. Surprisingly, it is free to get CC license and it takes only a few minutes, very user friendly. Meanwhile, it is still a little bit confusing about public domain. Everything which was produced before January 1 of 1923 belongs to the public domain. In addition, if copyrights have expired, those creation also become public’s property. However, you still can be charged for some movies or pictures in a good quality format. Fair use can only be used for certain purposes such as criticism, new, reporting, teaching, and parody. However, one should be careful when borrowing pieces of creations because your rights in this case are very limited. There is a big misunderstanding concerning fair use. Some users think if they acknowledged the source then it is fair use. That is wrong. Just providing a name is not enough. it’s a matter of plagiarism – professional ethic. While plagiarism and copyright significantly relate to one another, they are not the same because copyright is a matter of law which by the way doesn’t allow to “fair use” ideas. People use a lot of things on internet thinking that it doesn’t belong to anyone. But it does. Numerous of movies, sound tracks, applications, etc. are being downloaded without permissions. In a pool of millions and millions of users it may seem hard to get caught. But don’t fool yourself. Protective technology is developing just as fast as technology for doing inappropriate things. Remediation is the process whereby computer graphics, virtual reality, and the World Wide Web define themselves by borrowing from and refashioning media such as painting, photography, television, and film (Blakesley, A Review of Remediation: Understanding New Media). Immediacy is the perfection, or erasure, of the gap between signifier and signified, style of visual representation whose goal is to make the viewer forget the presence of the medium (canvas, photographic film, cinema, and so on) and believe that he is in the presence of the objects of representation (Blakesley, A Review of Remediation: Understanding New Media). Hypermediacy is a style of visual representation whose goal is to remind the viewer of the medium. Hypermediacy is an expression of our fascination with the medium itself (Blakesley, A Review of Remediation: Understanding New Media). Mediation is the representation of an object, a formative interface whereby the object of contemplation is structured and presented by some intervening medium. In this sense, it refers to the symbolic act itself and thus would include writing (Blakesley, A Review of Remediation: Understanding New Media). In the world of digital media, things are changing way too fast. It is a non-stop process. Today we try to perfect media; tomorrow we will try to get rid of it, etc. However, a lot of times “everything new is actually well-forgotten old.” Our goal in a class is not to know every little trend or program of today’s digital world, but try to play, experiment, perform, judge, network, etc in order to explore what the media is today, so we can easier adapt to the media of the next level when necessary. As Bolter and Grusin said, “content of the older media could simply be poured into the new one”(45). Blakesley, David. “A Review of Remediation: Understanding New Media.” n.d. 08 09 2012. Sitting in both “extremes” of the bench, is it an stereotype image of the old and the new media? In ever changing world media reflects the dynamic of its society. It doesn’t matter what we think of newspapers and magazines today if yesterday it was enough to suit the needs of previous generation. Now we have internet, millions of different website, etc. which are able to suit our needs today. We can only imagine what next generation will think of our blogs! Therefore, there is no need to judge the old culture; we should better look at it as a result of remediation – the process where “new media offers new means of gaining access to the older materials” (Grison and Bolter 45). In his article Jenkins presents topic on learning and technology (2009). Jenkins introduces new era of participatory culture. 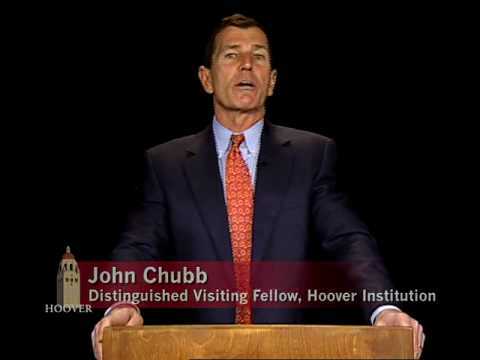 He states that “interactivity is a property of technology while participation is a property of culture” (8). Each form of participatory culture contains opportunities for learning, creative expression, civic engagement, political empowerment, and economic advancement. 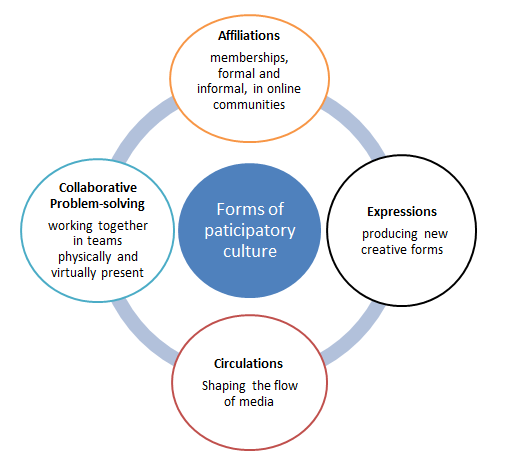 Participatory culture makes people feel free to contribute, provides strong incentives for creative expression and active participation, and allows long-distance collaborations across different learning communities that are physically and virtually present. Jenkins in his work introduces Gee’s ideas about affinity spaces, informal learning cultures (9). Gee compares affinity spaces and formal educational institutions. According to Gee (2004), people learn more, participate more actively, and engage more deeply with popular culture than they do with the contents of their textbooks. He describes affinity spaces as experimental, innovative, provisional, change with time, and localized while he describes formal institutions as conservative, static, institutional, little change, and national. More detailed description of his work can be found here. According to Jenkins (2004), current tendency is that people acquire skills on their own. However, it presents certain obstacles such as participation gap, transparency problem, and ethics challenge (3). Therefore, it would be better for society if people acquire new skills with the help of professional educators; however, modern educational system requires dramatic changes and much more attention. “Affinity space.” Wikipedia.Web 30 Aug. 2012. Interactivity is a property of technology. Participation is a property of culture. Old media includes newspapers, magazines, direct mail advertising, radio and television. Old media have limited number of old media producers, it is also limited geographically. Has one way communication. Producer if media has total control. New media includes World Wide Web which has unlimited number of producers. It is not limited geographically – consumer only needs computer and internet access. Provides two-way communication. Producers have no control over what consumers say. According to Gee (2004), old media reflects formal institutions which are conservative, static, institutional, little change, national. While new media which reflects affinity spaces (Informal learning environment) which are experimental, innovative, provisional, change with time, localized.